Men’s Hockey: UMass Lowell tops UConn, takes tournament. STORRS, CT- In the finals of the Toyota Hockey Classic, UMass Lowell took on the host UConn Huskies. In goal for the River Hawks was Doug Carr, and for UConn, Garrett Bartus. It took until 14:37 for a goal to go on the board as UML’s Scott Wilson scored from close range assisted by Stephen Buco and Josh Holmstrom. David Vallorani picked up UML’s second goal about 4 minutes late when he knocked a rebound past the keeper. Assists went to William Eiserman and Riley Wetmore. Any penalties in the period had no affect on scoring. The period ended with UML up 2-0. At 14:10 in period 2, Terrence Wallin slid around the back of the goal and scored on the wrap around to put the visitors up 3-0, with Matt Ferreira, and Scott Wilson picking up the assists. A UMass Lowell slashing penalty at 18:02 gave UConn an opportunity and Sean Ambrosie put it to good use, assisted by Billy Latta and Brant Harris 24 seconds later. The period ended with Lowell up 3-1. But period 3 would change the dynamic of the game quickly. At 1:47 Cody Sharib knocked a rebound into the net assisted by Miles Winter and Jordan Sims. However on the play UML picked up a penalty and sent a player to the box. UConn entered the power play, and was setting up when the puck went to Billy Latta who rocketed a long shot from back in the zone and in to tie it up. Assist went to Sean Ambrosie. So within 2 minutes a tie game resulted, and neither team would score the rest of period 3. Lowell had a couple of power plays but could not capitalize. Due to the special tournament rules it was a full overtime session to be played, and so with 20 minutes on the board the two teams went at it. The River Hawks attacked the UConn net with great fury but Bartus and the defense held them off. The UConn penalty killing units also held UML off twice. 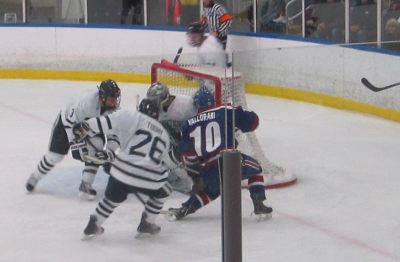 At 13:01 though a UML shot went flying at Bartus, he deflected it, but Vallorani was waiting on the other side of the net to score and win the tourney. Assists went to Derek Arnold and Riley Wetmore. In winning the tournament, UMass Lowell rose to 12-5-0, and UConn dropped to 6-10-2. Carr made 26 saves and is now 11-2, and Bartus made 39 on his way to a 6-10-2 record. Based on eyewitness account based against official box score.